I will forgive your sins and then forget them. God is Omnipotent, Omnipresent and Omniscient. He is all powerful, He is everywhere and He is all knowing. Yet the God who created the heavens and the earth with just the sound of His voice has decided to have a poor memory when it comes to our sin. 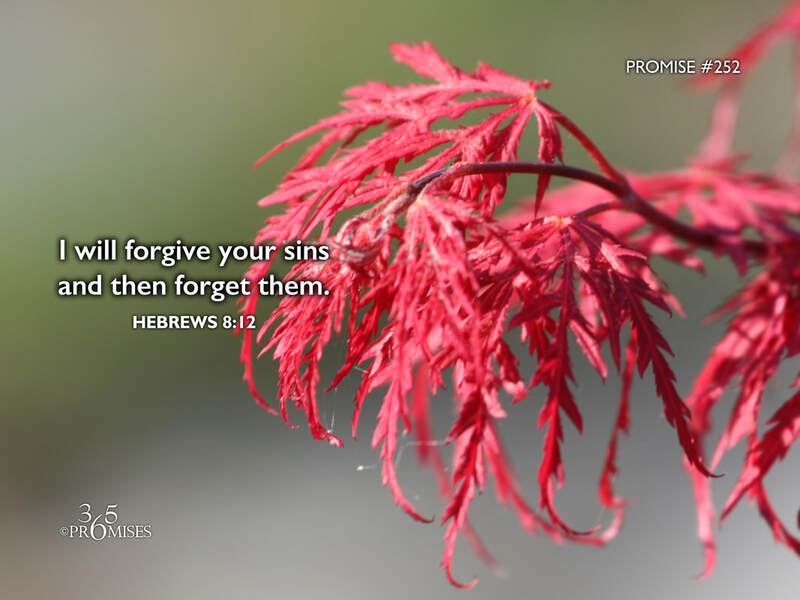 In today's promise, God says that He will forgive all of our sins and then forget each of one of them. The One who is limitless in every way, has chosen to intentionally forget every mistake, every failure, every time we have hurt Him because of the blood of Jesus Christ. Sometimes I wonder if I actually live each day in the knowledge that God has forgiven me so completely that He can't even remember one time when I have sinned. As Paul the Apostle said, "Do we keep on sinning that grace abound? God forbid!" However, if we allow the full weight of this promise to seep deep into our hearts, we won't be continually re-counting our sin over and over in our own minds (and perhaps in our prayers).